If you want to learn to scuba dive in Bali – then this is where the adventure starts! As a certified diver, you get to dive in places where you will encounter sea life, reef systems, wrecks, and caverns that are beyond the reach of snorkelers. In other words, scuba diving allows you to discover a whole new world that many people never get the chance to experience. One of the world’s most popular scuba diving certifications is PADI Open Water Diver. With this certification, you will be qualified to scuba dive all over the world to a recommended maximum depth of 18 meters. If you are short on time but really want to become a diver, there is PADI Scuba Diver which takes 2 days only. Upon completion of this course you will receive a certification which allows you to dive anywhere in the world with a PADI Professional to a maximum depth of 12 meters. Also, you can easily upgrade from PADI Scuba Diver to PADI Open Water Diver at a later date. Get your PADI Open Water Certification in Bali! If you have ever wanted to learn to scuba dive in Bali – then this is where the adventure starts! By completing the PADI Open Water Diver Course, the world’s most popular scuba diving certification, you will be qualified to scuba dive all over the world! The PADI Scuba Diver course is the first step in becoming a PADI certified diver. 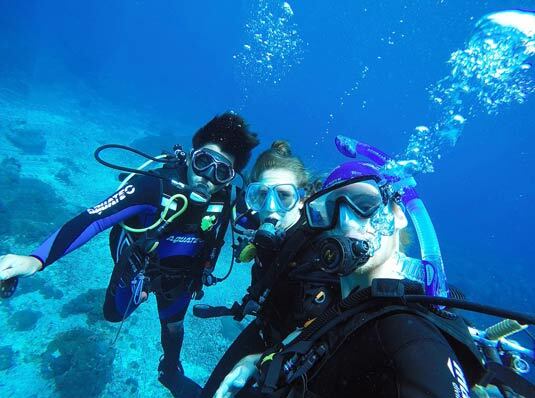 This two day diving course is designed to accommodate those divers that do not have enough time to complete the full PADI Open Water Diver course but want to get started with their diving adventure. Ready to try out a PADI scuba dive course in Bali? Get in touch with us today. To aid you in your training and to give you more time to relax and concentrate on your diving in Bali we have introduced a number of PADI training courses that can be accessed online, this will give you access to all materials, saving you time. Click here for more information. PADI Training materials to keep. Lunch and bottled water throughout the course. Did you know that you can combine your PADI Diving Courses? Take your Peak Performance Bouyancy Course alongside your PADI Open Water Diver Course; Add the Nitrox Specialty Diver Course or Sign up for your Advanced Open Water Course together with your Open Water Course and SAVE. Have a look at our Specials page here, or get in touch for more information. Never dived before? It’s time to try the PADI Discover Scuba Diving program.